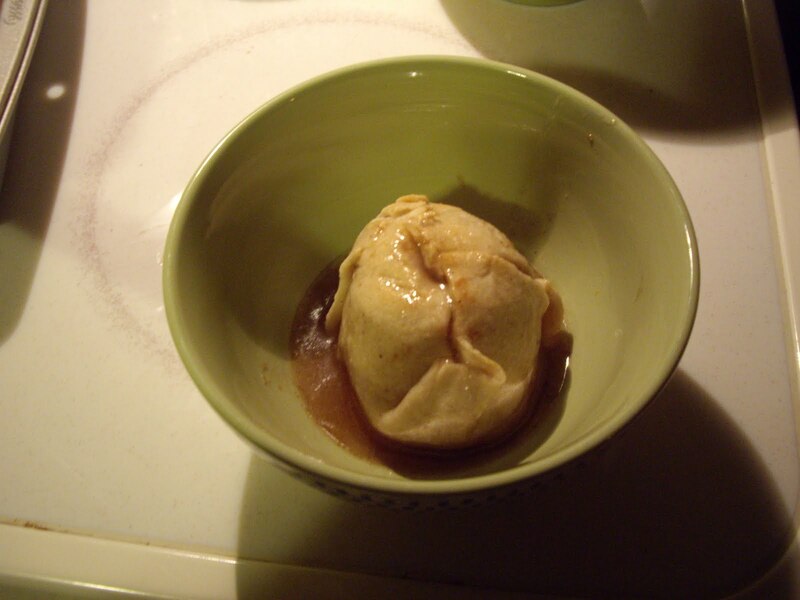 An apple dumpling is an apple baked inside a piece of pastry. They are best served warm and maybe even with some ice cream on the side. You will need a 11″ x 7″ pan or a 9″ x 13″ pan. Combine in a saucepan and bring to a simmer. Cover and let simmer for 5 minutes. Add butter to the syrup. Combine the flour and salt in a medium bowl. Cut in the shortening with a fork or pastry cutter until the shortening is the size of small peas. Add the water a little bit at a time, mixing just til it is moistened. Roll it out on a floured counter or board to approximately 18″ x 12″ size. Cut into 6 equal pieces. Peel and core the apples. You can use you vegetable peeler for this. Or you can use a separate apple corer to core the apples. Otherwise, you can slice the apple in half and cut the core out and stick both halves together on the pastry square. Once all the apples have been peeled and cored, put them each on their own piece of pastry. Combine the sugar, cinnamon, and nutmeg. Sprinkle over the apples. Moisten the edges of the pastry squares with water. Bring up the four corners over the apple and pinch the dough together to seal. Place the pastry covered apple in the baking pan. Pour the syrup over the dumplings. Bake for 45 minutes or until the apples are tender and pastry is browned slightly. To serve, spoon syrup over dumpling. Makes 6 yummy apple dumplings.